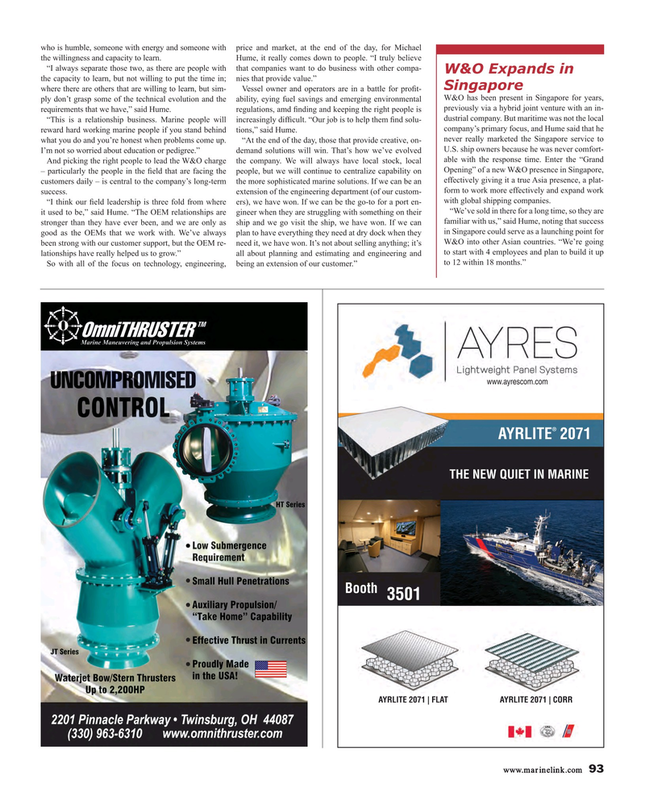 W&O has been present in Singapore for years, ply don’t grasp some of the technical evolution and the ability, eying fuel savings and emerging environmental previously via a hybrid joint venture with an in- requirements that we have,” said Hume. regulations, amd ? nding and keeping the right people is dustrial company. But maritime was not the local “This is a relationship business. Marine people will increasingly dif? cult. “Our job is to help them ? nd solu- company’s primary focus, and Hume said that he reward hard working marine people if you stand behind tions,” said Hume. Opening” of a new W&O presence in Singapore, – particularly the people in the ? eld that are facing the people, but we will continue to centralize capability on effectively giving it a true Asia presence, a plat- customers daily – is central to the company’s long-term the more sophisticated marine solutions. If we can be an form to work more effectively and expand work success. extension of the engineering department (of our custom- with global shipping companies.